The U.S. announced sanctions Monday against Venezuela's state-owned oil company amid a constitutional power struggle in that nation. WASHINGTON — President Donald Trump is leaving open the possibility of a U.S. military intervention to protect opposition leader Juan Guaidó, members of the nation's assembly and American diplomatic personnel, national security adviser John Bolton said Monday. "The president has made it clear that all options are on the table," Bolton told reporters in the White House briefing room. Venezuela's government is embroiled in a power struggle after Guaidó declared President Nicolás Maduro illegitimate last week under a provision of the nation's Constitution. The Trump administration has recognized Guaidó as the leader of the country. Bolton and Treasury Secretary Steve Mnuchin, who also appeared at the briefing, announced that the U.S. would impose new sanctions on PDVSA, Venezuela's state-owned oil company, as a means of putting more pressure on Maduro's regime. 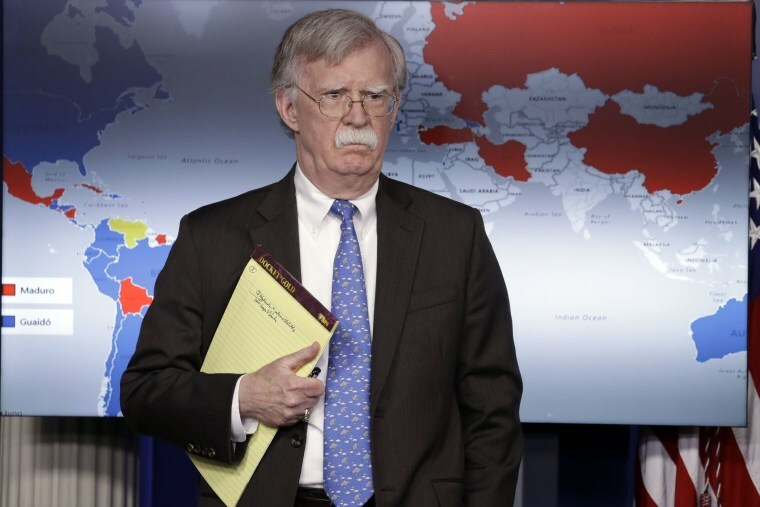 "We also today call on the Venezuelan military and security forces to accept the peaceful, democratic and constitutional transfer of power," Bolton said. Maduro has so far refused to schedule new elections to resolve the dispute over who is the legitimate leader of the country.